I'll sign off now. Thanks for your company on what turned out to be a good day for Hibs at Hampden. Conrad Logan was the undisputed hero, making some good stops and saving two penalties in the shoot-out on a remarkable debut, while Jason Cummings redeemed himself after a first-half penalty miss by tucking in the winning spot-kick. We'll do this all again tomorrow when Rangers and Celtic meet at Hampden. Who will go through to meet Hibs? It was a tame, one-sided affair when the Glasgow rivals met last season but it should be a keener contest this time, with Rangers massively improved since then. Live text will begin at 11:00 BST on Sunday, with BBC Radio Scotland's Sportsound providing commentary. Make sure you join us for that. Hibs have been dreaming up new ways to torture their fans of late with a series of calamities in the Championship. Today they conjured up another novel way of putting their followers through the mill, missing a penalty when they were well on top and then falling out of the game completely in extra time before progressing on penalties. The Hibs spot-kicks were all expertly tucked away as well. Can they kick on from here and sort themselves out in the league? So, it's a second cup final for Hibs this season. We all know about their drought in the Scottish Cup, losing in 10 finals since 1902. Can they make it over the line this year? Or would Hibs fans go through another miserable day at Hampden in exchange for promotion? If they reach the play-off final, the Scottish Cup final will be bookended by the two legs of the big game for top flight status. That could be some week for Hibees. Could the nerves handle it? Could the players' legs? "I'm delighted. Part of me feels sorry for Dundee United, penalties are cruel. I felt we were good in the first half but United came into it and we got to a point where both teams didn't want to lose the game." On Conrad Logan: "I went for his experience and it looks like I made the right call." "We have five massive matches coming up and we can't afford to have anyone feeling sorry for themselves." Can United respond to today's disappointment and pull off a Great Escape from relegation? Can Hibs boss Alan Stubbs possibly drop Conrad Logan now? Mark Oxley has been his number one all season but it will be a big call to reinstate the former Hull keeper. 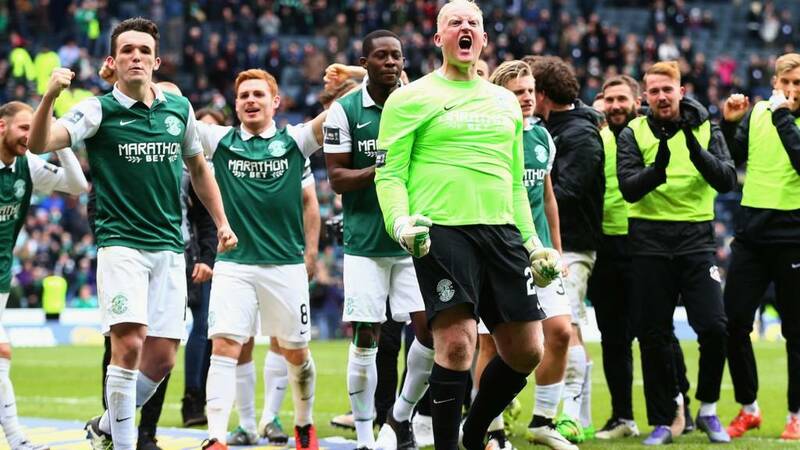 Hibs hero Conrad Logan: "It's a great achievement for the club and I'm just buzzing to be part of it. "I got the nod 10 minutes before the warm-up that I'd be playing and I felt sharp and ready to go. It's pretty much the perfect day." Well it wasn't a classic. Far from it. But Hibs are into their third Scottish Cup final in five years and their second cup final of the season. Who will they play? Rangers and Celtic go head-to-head at Hampden tomorrow. It's an amazing story for Conrad Logan! The goalie arrived at Hibs a few weeks ago after 16 months out of the game, brought in as cover for first choice Mark Oxley, who was suspended today. He was expected to be on the bench but his surprise selection was thoroughly vindicated. He was rock solid and made two good stops in the shoot-out. Cools as you like, Cummings slots it past a static Eiji Kawashima. Hibs are into the Scottish Cup final. Guy Demel scuffs one down the middle. Martin Boyle high into the net. Paul Dixon drills one into the corner. Paul Hanlon scores. Low and hard. Logan again! He saves from Billy McKay.